This coming Sunday, August 30th, I have the privilege of preaching on Acts 15 – and the subject of homosexuality and the church. I especially want parents of young children to know that this will be addressed, along with circumcision. This will be a “PG” (parental guidance) message but undoubtedly your young children will ask, “What is homosexuality and circumcision?” Therefore, each parents(s) needs to prayerfully discern if this sermon is appropriate for their child(ren). How on earth (not to mention the pulpit) you may say, do you see homosexuality spoken of in Acts 15? Great question, thanks for asking. Acts 15 addresses a volatile controversy that could have easily split the early church. Certain Jewish believers wanted to impose the requirement of circumcision upon Gentile believers. After much deliberation and debate, the so-called “Jerusalem Council” of church leaders resolved the issue and sent a letter to the Gentile believers regarding their decision. Acts 15 continues to be a powerfully relevant account for the 21st century church for at least three reasons. First, it is a stunning refutation of legalism and a thunderous affirmation of salvation by grace alone, in Christ alone, through faith alone. Second, it speaks volumes about the connectional nature of the church and supports presbyterianism as the biblical form of church government. Third, it presents a Solomonically-wise model for how churches (and denominations) should address controversial issues that threaten its peace, purity, and unity. What contemporary issue has already been divisive among evangelical Christians and will continue to threaten the peace, purity, and unity of today’s church? Long before the recent SCOTUS decision, Christians have debated this volatile topic among themselves. Is homosexuality a sin that disqualifies someone as a Christian? Should the church welcome or ban homosexuals from its worship, fellowship, membership, ministry, etc.? Of course like any other pastor, I have both my personal opinions and theological convictions on this matter. Earlier this month, at our session “study meeting” (we conduct no business or pass no motions at these meetings, but explore one topic we believe relevant to the health and future of Central), we had a healthy discussion on this matter and will continue to seek the mind of Christ on it. What can you do? Thanks for asking! I can think of at least three obvious things. First, pray for the elders (session) of Central that we would seek the mind of Christ in this matter. We desire to be rooted in the Scripture and led by the Spirit in all things. Second, pray that the Lord would speak to your own heart and mind and at the same time remove from all of us any prejudicial, circumstantial, emotional, or cultural filters that distort our ability and willingness to see and do the Lord’s will in this matter. Third, pray that the Lord would advance in us and through us our church vision and mission to know, be known, and make known the gospel of Jesus as we seek to be His transformed people who passionately love His truth (know), transparently pursue the fellowship of His people (be known), and lovingly communicate the grace of His gospel (make known) – all for His glory and the building of His kingdom. May it be so. Forty years ago Tacey and I were both students at Gordon-Conwell Theological Seminary in South Hamilton, MA. It was a blessed time for us as we worked our way through school. I was the grounds keeper and Tacey was the house keeper on a large estate (we lived in the servant’s quarters which was our little version of Downton Abbey – but much more dramatic). My preaching professor was a wonderfully kind, older gentleman from Wales. He cared deeply about the careful exposition of God’s Word and that the Lord’s people needed to remember and apply that Word to their lives. His method, however, was a wee-bit narrow. Every sermon we wrote was to have three points (no more and no less) and all three points were to begin with the same letter (alliteration). I found this approach to be dogmatic, demanding, and demeaning. Nevertheless, I was determined, dutiful, and deliberate in my attempts to comply. The rationale for the classic three-point sermon was based on the notion that the typical adult parishioner was not able to remember more than three points. We want to know Christ and His Word, which is why we place great emphasis on Bible preaching, Sunday school and Equip Central classes, and the study of God’s Word in homes, small groups, and a host of other venues. We want to be known in the context of Christian community. We recognize that relationships matter deeply to God and that flying solo in the Christian life is fraught with danger. God created His church to be a place where His children delight in knowing and serving Him and in knowing and serving each other. We want to make known the glorious gospel of Christ to those all around us, both locally and globally. We do this by loving and serving our neighbor in deeds of mercy and justice and evangelistic ministry. There you have it – our collective reason for being. 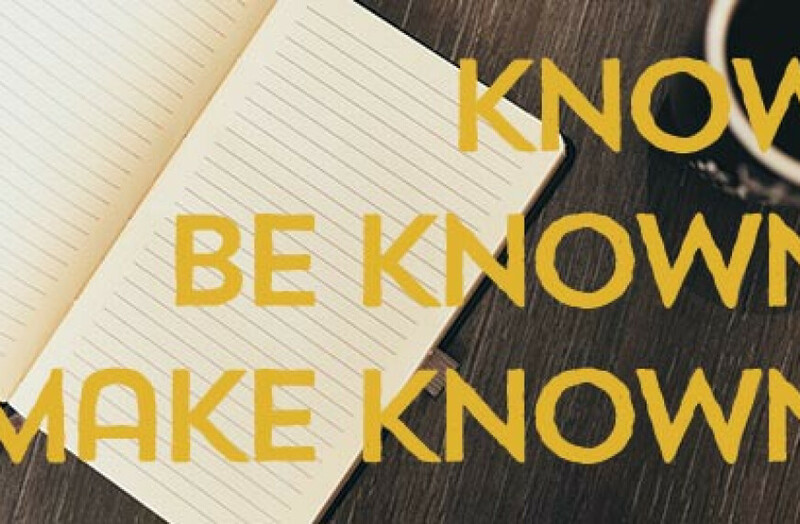 This is how we glorify the God of the Bible: know, be known, make known. When congregations have a clear God-honoring direction and purpose, it brings greater clarity, unity, and focus to them. Ministries begin to align with these purposes, resources are stewarded to achieve these purposes, and people are energized to pursue these purposes. You will be hearing a great deal more about this at Central. For now, would you be willing not simply to memorize our purpose but also to prioritize it in your prayers? My departed seminary professor would be pleased with this approach. After all, it is clear, concise, and compelling. The parking lot was full and I was nervous and about to have a double rude awakening. Others had fancy bags over their shoulders while I had a tattered paddle stuck in my belt in the small of my back. No one said a word to me as we walked into the large gymnasium and waited in the registration line. The person sitting behind the registration desk simply said: “Sign here, the cost is $20, wait in those bleachers.” And so it was as I waited to play my first match at a large table tennis association. “Pastor Bob, I didn’t know you were such a ping pong ninja. How did that happen?” Thanks for asking. Tacey and I sensed God leading us to plant a new EPC church in Orlando in 2008. We knew one couple, but other than that not a soul. There was no core group. So I did what most church planters do (and what all believers should be doing) – I started to look for opportunities to meet and befriend people who probably don’t know Jesus. I joined a local gun club that yielded one new friendship. Then I saw an ad in the local paper for a table tennis club. Cool, after all I was the reigning ping pong champion of the Hopper household (although Tacey would give me a run for my money – she is so competitive and needs to repent of that). The Lord, in His kind providence, taught me two things that night. First, I am not a very good ping pong player (I got crushed in every match I played). Second, many visitors to many churches feel the exact same thing when they visit on a Sunday morning. Through our neglect, they feel intimidated, invisible, and unwelcome. This ought not to be so. At Central, we are doing something about that. In fact, it is the primary reason we have changed our service times and designated our Fellowship Hall for . . . fellowship! Starting this Sunday, our new schedule begins. We thank the Lord for Julie Krauss and all the volunteers who made our summer brunches so spectacular. Now we embarking on a exciting and intentional journey to transform Central into a warm and welcoming place for those whom the Lord brings to us as visitors. Consider a few ways that this new schedule will help us be more visitor-friendly. We will be less rushed between services, which will allow us to engage newcomers more easily. We have a place (Fellowship Hall) where you can invite a newcomer to share a cup of coffee. Take them there and introduce them to someone else (its OK to be a little late for or even miss your Sunday School class). There will be several pastors and staff present there, so please introduce your guest to one of them. Imagine that from parking lot orange-vested volunteers, greeters, ushers, and congregants our visitors sense that they are welcomed, cared for, and introduced to the love of Christ through each of us! 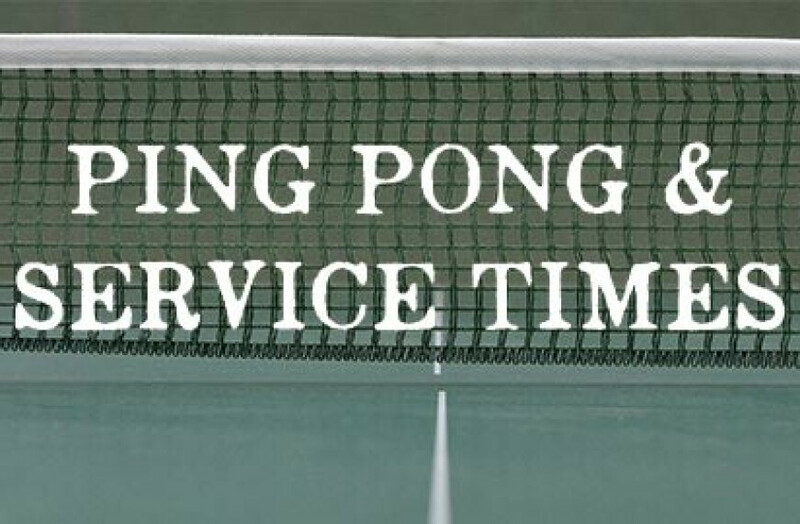 Lessons learned from my ping pong experience place a burden on my heart that the people of God would demonstrate the love of God to people who desperately need to discover the grace of God. Last Sunday one of our warm and welcoming members invited an unchurched co-worker to Central for their first visit to a Protestant church. Everything was new and strange and unfamiliar. Yet I was so blessed to see how this newcomer was being engaged by our members, and on my way out they made a point to approach me and thank me for what they had just experienced. That, dear friends, is the gospel in action! No one on this planet will perish because they can’t play ping pong. Countless will perish unless they come to know Jesus. We have the great privilege to be the means (secondary cause) to that glorious end. May it be so. P.S. Don’t forget to take advantage of our excellent Sunday School offerings for all ages. In fact, you might even treat the visitor that you have befriended to a cup of coffee, and then invite them to go with you to one of these classes.